Tăng âm liền TOA A-1700 dùng cho hệ thống âm thanh công cộng hội thảo, thông báo : thiết âm thanh phòng hộp, hội nghị, nhà thờ , trường học,.. 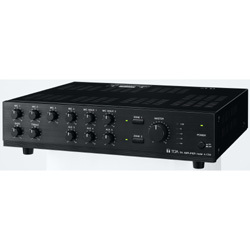 Featuring multiple mic inputs as well as three auxiliary inputs,the A-1700 Series of amplifiers have three different power ratings to select from depending on the venue. These units offer efficient mixing of as many as 9 different inputs. If more aux inputs are required, mic inputs 5 and 6 can be switched over to accept line level inputs. Each A-1700 Series amplifier has 2 speaker output zones which can be independently selected or used together for enhanced PA applications. The A-1700 Series of amplifier provide phantom power to all connected microphones. Phantom power can switched on or off as needed. The microphone inputs feature a balanced configuration with XLR connectors, allowing long cable runs without any problems. Each amplifier allows easy tonal adjustment of all output signals with bass and treble controls. A-1700 Series amplifiers will respond to remote control signals, allowing remote volume adjustments and remote power on/off. ← LOA ÂM TRẦN CÓ PHẢI LÀ TÊN GỌI KHÁC CỦA LOA GẮN TRẦN?